Actors and filmmakers involved in “Spotlight,” and Boston Globe journalists, accpeted the Best Picture award. The Oscars came home to Boston at the 88th Academy Awards Sunday night as “Spotlight,” a drama about the Boston Globe’s investigation of clergy sexual abuse and the cover-up by the Roman Catholic Church, was named best picture of 2015. In addition, the writing team of Josh Singer and director Tom McCarthy won the Oscar for best original screenplay. 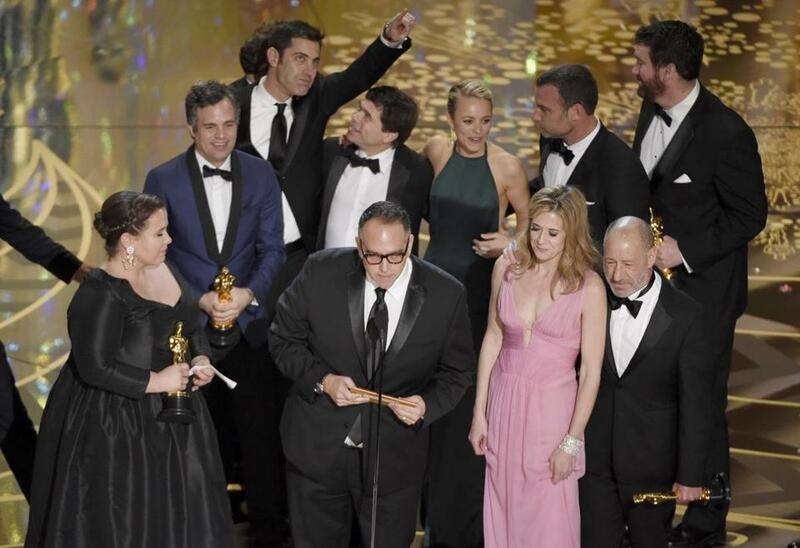 “This film gave a voice to survivors and this Oscar amplifies that voice, which we hope will become a choir that will resonate all the way to the Vatican,” said “Spotlight” producer Michael Sugar as he accepted the award while the film’s cast — and some of the people they portray — stood behind him on stage. “The Revenant,” a widescreen period adventure that called to mind the epics of Hollywood’s glory years, won awards for best director for Alejandro González Iñárritu and for star Leonardo DiCaprio, who took home a long-awaited Oscar for best actor. Brie Larson won best actress for her performance as an extremely beleaguered young mother in the low-budget drama “Room.” “The thing I love about moviemaking is how many people it takes,” Larson said before gratefully rattling off thanks to everyone involved, up to and including audiences who saw the film. “Mad Max: Fury Road,” a post-apocalyptic action film of the sort that rarely breaks into the awards circuit, won six of its 10 nominated Oscars for the evening’s biggest haul. The film, directed (like all of the “Mad Max” films) by Australia’s George Miller, won Academy Awards for costumes, production design, makeup and hairstyling, editing, sound editing, and sound design. Swedish actress Alicia Vikander took the best supporting actress Oscar for her role in “The Danish Girl” as the artist-wife of a man undergoing sexual reassignment surgery in 1920s Europe. In her acceptance speech, Vikander thanked her director, Tom Hooper, and her costar, last year’s best actor, Eddie Redmayne. The Oscar for best supporting actor went to England’s Mark Rylance for playing a circumspect Russian agent in Steven Spielberg’s “Bridge of Spies.” Many expected voters to go with sentimental favorite Sylvester Stallone for his return to Rocky Balboa in “Creed.” Rylance acknowledged his fellow nominees in a chatty acceptance speech that appeared to contain more words than his roles in “Bridge of Spies” and TV’s “Wolf Hall” combined. In the weeks leading up to the ceremonies at the Dolby Theatre in Los Angeles, three of the eight best picture contenders, “Spotlight,” “The Revenant,” and “The Big Short,” seemed to jostle at the head of the pack. That uncertainty provided the 2016 Oscar race with a rare note of suspense: Would voters opt for the old-school period epic about a man struggling against the elements, a financial farce that juggles satire and outrage, or the quiet but powerful drama about journalists uncovering a staggering institutional cover-up? In the end, the understated drama and social impact of “Spotlight” prevailed over the glossy filmmaking and onscreen grit of “The Revenant.” Still, Iñárritu’s Oscar for best director, coming a year after his statuette for “Birdman (Or the Unexpected Virtue of Ignorance),” made him the first back-to-back winner in the category since Joseph L. Mankiewicz in the 1950s and John Ford in the 1940s. “Son of Saul,” a grueling Hungarian drama set in the death camps of Nazi Germany, won the Oscar for best foreign language film. The award for best animated feature went to “Inside Out,” a computer-animated adventure that takes place inside a young girl’s brain and that was widely seen as a return to form for the beloved production company Pixar. The best documentary feature Oscar went to “Amy,” Asif Kapadia’s nonfiction film about the life and struggles of pop singer Amy Winehouse. In one of the evening’s genuine surprises, the low-budget sci-fi thriller “Ex Machina” won the award for visual effects over movies with deeper pockets like “Mad Max: Fury Road,” “The Revenant,” and “Star Wars: The Force Awakens.” The last film, which is now the biggest box office hit in US history, was nominated for five Oscars and won none. Every year there’s an Oscar controversy, and this year’s was a serious one that will continue to reverberate long after the champagne glasses have dried. With no actors of color being nominated for the second year in a row, the creative community was roiled by a long-needed discussion about diversity in Hollywood — about who gets cast and whose stories get told. While some actors (Will Smith and his wife, Jada Pinkett Smith) and filmmakers (Spike Lee, Michael Moore) chose not to attend this year’s awards, and the Rev. Al Sharpton led a protest earlier Sunday afternoon near the Dolby Theatre, most discussions on the subject moved beyond the Academy Awards to embrace what they represent: An entertainment industry whose products are a reflection of the white men who run it. The controversy has spurred Cheryl Boone Isaacs, president of the Motion Picture Academy of Arts and Sciences, to announce new membership requirements and limits in an effort to broaden the pool of Oscar voters. It certainly provided plenty of red meat to the ceremony’s host, comedian Chris Rock, who had the audience of Hollywood glitterati laughing nervously throughout. Honorary Oscars were given in November at the Governors Awards to filmmaker Spike Lee and actress Gena Rowlands. Classic era Hollywood star Debbie Reynolds won the Jean Hersholt Humanitarian Award for her philanthropic efforts for veterans struggling with mental issues. The Motion Picture Academy of Arts and Sciences is made up of more than 6,000 members of the film industry, with branches representing all major crafts, from acting and directing to sound and costume design.